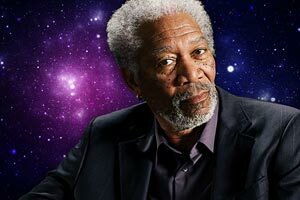 This post on Universe Today prompted me to write up my own little plug for the Science Channel’s new(ish) show Through the Wormhole with Morgan Freeman. The show is in its second season and is seeing more success than your average run-of-the-mill science show. Obviously having a celebrity figure like Morgan Freeman as the host is big reason for that, but watch the show and you’ll really understand why. It’s just uncannily appealing to hear Freeman’s warm, grandfatherly voice talking about quantum entanglement, time travel, string theory, relativity and all sorts of other fascinating topics that are at the very edge of modern science. The context and delivery of the information is unique, too. It’s hard to present what most average folks regard as “mumbo-jumbo” in a way that keeps them interested for a whole hour, but this show manages to pull it off. Freeman’s own genuine interest in the subject matter is definitely a big reason the show is successful; he has always had a keen interest in these edgey topics and simply decided to make a show in which he both asks these questions to real scientists who are working to answer them and attempts to share that sense of awe and wonder that inspired him to ask said questions to begin with. Tonight’s episode focuses on the question “can we travel faster than light?” This is obviously a very important question to answer if mankind is ever to explore beyond our own solar system. All those convenient workarounds (warp drives, hyper-space windows, wormholes, etc…) you see in science fiction actually have some basis in real scientific principles, and I suspect we’ll get much clearer and layman-friendly explanation than ever before of those principles on tonight’s episode. It airs at 10pm eastern/9pm central on the Science Channel, which most of you should now get if you have regular cable or satellite service.